Sen. Claire McCaskill (D.,Mo.) said on Wednesday that she will vote against Judge Brett Kavanaugh's confirmation to the Supreme Court. "It is his allegiance to the position that unlimited donations and dark anonymous money, from even foreign interests, should be allowed to swamp the voices of individuals that has been the determining factor in my decision to vote no on his nomination," she said in a statement. McCaskill had been considered a potential swing vote as most voters in her home state supported Trump in the 2016 election. McCaskill previously described her upcoming vote on Kavanaugh as "damned if you do and damned if you don’t." Kavanaugh's confirmation hearing is set to continue on Monday as sexual assault allegations against him from three decades ago dominate the news cycle. McCaskill, however, claims the sexual assault allegations against Kavanaugh had no influence on her decision. "I'm going to make the decision based on his positions, his writings in his decisions, and what I've discovered in the documents I've had a chance to review. That's how I'll make my decision," she said. Brian Rogers, the executive director of Missouri Rising Action PAC, issued a statement Wednesday evening condemning McCaskill's decision. Missouri Rising Action has backed McCaskill's opponent. "Senator McCaskill is once again siding with the liberal Democratic elite over the values and interests of Missouri. Despite her campaign-season claims to be a moderate, tonight she once again nodded to the Chuck Schumer and the national Democrat Party establishment," he said. "Missourians have the chance to make their voices heard when they retire Claire McCaskill this November." McCaskill is up for re-election this fall and faces Attorney General Josh Hawley, who has made the confirmation of Kavanaugh a central issue to his campaign in the red state. Hawley said in a statement that "nobody is surprised" at McCaskill's decision. "Nobody is surprised. 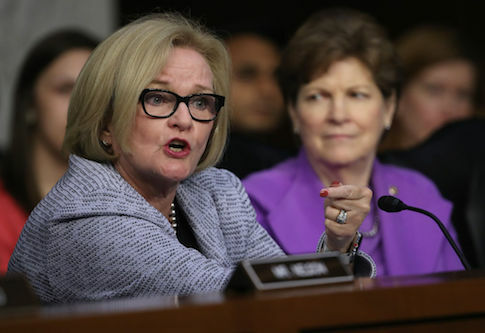 Claire McCaskill is now 0 for 6 on Supreme Court nominees since she started running for the Senate 12 long years ago," he said. "She has sided with Chuck Schumer every single time – for liberals and against Missouri. Senator McCaskill has forgotten where she’s from and become just another Washington liberal." UPDATE 9:09 P.M.: This article was updated with Hawley's statement. This entry was posted in Politics and tagged Brett Kavanaugh, Claire McCaskill. Bookmark the permalink.